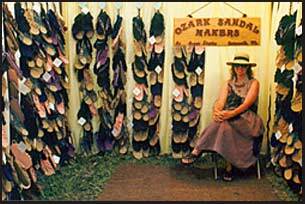 Ozark's Rope Sandals is a woman-owned company that started back in 1983. I was homesteading and looking for a way to work at home while my children were young. I was given a pair of rope sandals, and loved them! Fortunately I was able to convince the company that made them to teach me how, and the sandal business was born. In the beginning, the sandals were sized small, medium, and large, and there were only two colors available, beige and brown. 1989 was a landmark year, we were finally able to offer black. It eventually became the number two selling color, second only to beige. As the years went by, we refined the patterns, added more sizes, and introduced new colors. Currently, we offer a full range of sizes and colors for both men and women. In 2003, I retired from making sandals and handed the business over to my daughter, Autumn, who has been a part of the business since she was thirteen years old. Autumn has made many positive changes to the business and is committed to providing the same handmade quality that our loyal customers have come to expect over the years. The sandals are made from durable, colorfast polypropylene rope. Water does not hurt them because they are melted together instead of glued. They have excellent traction when wet, and they are machine washable. They last for several years. We guarantee the sandals for a year, and many customers are able to wear theirs for many years. They are lightweight, cool, and they bend easily. The ropes are soft and comfortable on your feet, and the heel-strap holds them on securely. My kids even climbed trees in them!